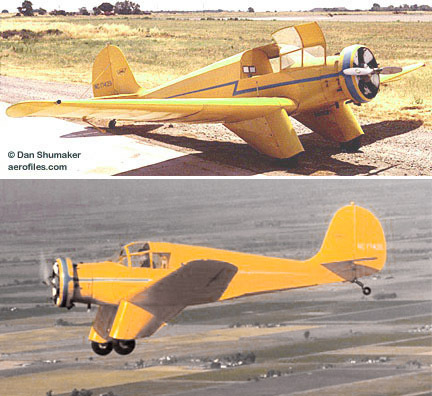 1928: Aeronautical Corp of America, formed from Roché-Dohse organization, Lunken Airport, Cincinnati OH -- first US factory to produce sport light aircraft. 1929: Aeronca Aircraft Corp; 1940: Middletown OH. Wartime production of PT-19/23. 1949: Contract from Helio Corp for subassembly of Helioplane. 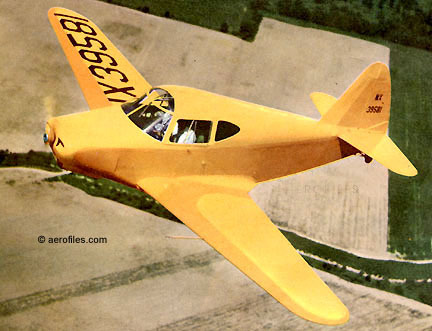 1951: Ended aircraft production, but design was continued by Bellanca and Champion. 19?? : Aeronca Inc, Fullerton CA. 197? : Aeronca Inc, Aerospace Group, Middleton. 6 1942 = 2pChwM; 75hp Continental C-75; span: 35'0" length: 22'8". Planned metal-framed replacement for KCA Chief. Development cut off by war, reportedly was cut up for scrap. POP: 1 [NX34484]. 7AC, 7ACS Champion 1944 (ATC 759) = 2pChwM; 65hp Continental C-65-8; span: 35'2" length: 21'6" load: 510# v: 95/85/38 range: 250; ff: 4/29/44 (p: Lou Wehrung). Raymond F Hermes (7-series). 7ACS (aka S7AC) was floatplane version. $2,095, $2,395 in 1947; POP: 7,200. To USAAF as L-16. Second only to Piper J-3 in popularity as a trainer, and a thrifty form of sport flying, the tolerant "Airknocker" was one of the roomiest of post-war lightplanes. 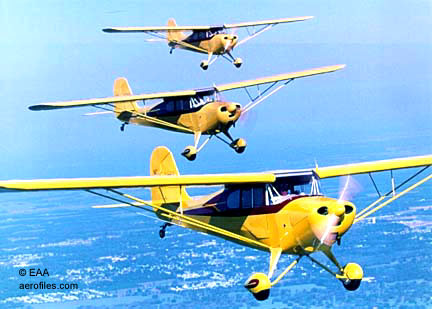 Design was revived in 1954 as Champion Citabria, later Bellanca Citabria. SEE Don't Knock the Knocker. 7BCM Champion 1947 (ATC 759) = 85hp Continental C-85-8. "No-bounce" gear (it really helped! ), reinforced fuselage, and other refinements. POP: 509, all of which went to USAAF as L-16A; prototype [NX3124E]. 7CCM Champion 1948 (ATC 759) = 90hp Continental C-90-8F (O-205-1). Larger dorsal fin, and wing tanks. POP: 125, plus 100 to USAAF as L-16B. 7DC, 7DCM, 7DCS Champion 1948 (ATC 759) = 85hp Continental C-85-8F; load: 491# v: 108/95/42. Dorsal fin and larger tail. 7DCM was Farm Wagon (with its classy, wood-lined cargo bin); 7DCS (aka S7DC) was the float version with a ventral fin. $2,510-2,665; POP: 168. 7EC, 7ECS Champion 1949 (ATC 759) = 90hp Continental C-90-12F; load: 560# v: 110/100/45 range: 290. 7ECS (aka S7EC) was float version. The first Aeronca to offer a starter and generator. $2,695; POP: 96. Illustrating the enduring qualities of this design, it appeared, liberally modified, in the 1958 Hindustan Aeronautics HAL-26 Pushpak 90hp trainer. Became Champion 7EC in 1955. 7FC Champion 1949 = Tricycle gear version of 7EC with C-90-12F. POP: 1 prototype. 9 Arrow 1943 = 2pClwM rg (manual); 90hp Franklin 4AC; span: 29'11" length: 19'9" v: 135/120/50. Edward Burn. POP: 1, destroyed in a test flight after propeller failure [NX39581]. 11AC, 11ACS Chief 1945 (ATC 761) = 2pChwM; 65hp Continental C-65; span: 36'0" length: 20'10" load: 525# v: 105/95/40 range: 330. 11ACS was the float version (aka S11AC). $2,395-2,585; POP: 1,862. 11BC, 11BCS Chief 1945 (ATC 761) = 85hp Continental C-85-8F. 11BCS was the float version (aka S11BC). $2,665; POP: 180. 11CC, 11CCS Super Chief 1948 (ATC 796) = 85hp Continental C-85-8F; span: 36'1" length: 20'5" load: 530# v: 110/97/43 range: 370. 11CCS was the float version (aka S11CC). Higher gross weight, and wider c/g range. $2,585-2,475; POP: 276. 12AC Chum 1946 = 2pClwM; 75/85hp Continental C-75/85; span: 29'0" length: 20'0" load: 590# v: 115/108/50. All-metal fuselage, fabric-covered wings, tricycle gear. POP: 2 single-tail Ercoupe designs built under license from ERCO [NX39637, NX83772]. Last one had a larger tail, knee-action gear, and all-metal wings. ATC approval (787) from Ercoupe. 15AC, S15AC Sedan 1948 (ATC 802) = 4pChwM; 145hp Continental C-145; span: 37'6" length: 25'4" load: 870# v: 120/105/53 range: 430 (?>456). Metal wing. S15AC was the float version, often with 145hp Franklin 6A4. POP: 561; prototype [NX/NC39800]. This model was the last of the Aeroncas, and a final production test flight on 10/23/51 (p: Earl Balon) marked the end of this popular marque, one day short of exactly 22 years! 50C Chief 1938 (ATC 675) = 2pChwM; 50hp Continental A-50; span: 36'0" length: 21'1" load: 460# v: 100/90/36 range: 270. Improved KCA with a wider cabin. $1,795; $1,695 in 1939; POP: 248. First lightplane non-stop Los Angeles-New York City flight, on 11/29-30/38, covered 2,785 miles in 30h:47m, avg: 90mph [NX21300] (p: Johnnie Jones)  its fuel cost-per-mile of about one cent was most impressive, even in 1938 dollars! 50F Chief 1938 (ATC 688) = 50hp Franklin 4AC. POP: 40. 50L, 50LA Chief 1938 (ATC 702) = 50hp Lycoming O-145; span: 36'0" length: 21'1" load: 460# v: 95/88/35 range: 275. 50L had exposed cylinders, 50LA had a closed cowling. $1,695; POP: 65 50L, 20 50LA. To USAAF as L-3. 50M Chief 1938 (ATC 676) = 50hp Menasco M-50; span: 36'0" length: 21'0" load: 460# v: 100/90/36 range: 250. $1,695; POP: 1 [NC21070]. 50TC, 50TL Tandem 1939 (ATC 728) = 50hp Continental; span: 35'0" length: 22'4". James Weagle (T-series). 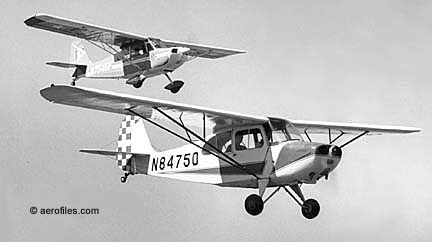 The first tandem Aeronca, as competition for the Piper Cub. POP: 16. TL had 50hp Lycoming; POP: 33. 60TF, 60TL Tandem 1940 (ATC 728) = Same as 50TC, with 60hp Franklin and slightly increased performance. 60TL with 60hp Lycoming. POP: 118; to USAAF as O-58B with 65hp Continental A-65. 65C Chief, 65CA Super Chief 1938 (ATC 675) = 2pChwM; 65hp Continental A-65; span: 36'0" length: 21'0" load: 480# v: 105/95/37 range: 260. Side-by-side seating. $1,795; POP: 279, of which many were impressed by USAAF as O-58/L-3 in 1942. 65CA with optional 8-gal auxiliary fuel tank, and other deluxe appointments. $1,895; POP: 655. 65LA Chief, 65LB Super Chief 1939 (ATC 702) = 65hp Lycoming. POP: 87. 65LB with 65hp Lycoming O-145 in 1940. POP: 199. 65TC Tandem, 65TAC Defender 1940 (ATC 728) = 65hp Continental A-65; span: 35'0" length: 22'4" load: 423# v: 94/80/35 range: 230. $1,695; POP: 112. 65TAC was CPTP and CAP versions; POP: 154. 65TF Tandem, 65TAF Defender 1940 (ATC 728) = 65hp Franklin 4AC. POP: 59. 65TAF was CPTP and CAP versions; POP: 115. 65TL Tandem, 65TAL Defender 1940 (ATC 728) = 65hp Lycoming O-145. To AAC as O-58 and L-3. POP: total 299, plus military: 4 YO-58, 20 O-58, 701 L-3B, and 499 L-3C, plus 253 TG-5 gliders to AAF. 65TAL was CPTP and CAP versions; POP: 100. C-1 Cadet 1931 (ATC 447) = 1pOhwM; 36hp Aeronca E-113; span: 29'0" length: 20'0" load: 274# v: 93/80/35 range: 240. POP: 3, of which 1 was modified as C-2N [NC11417], and 1 was scrapped after the prototype [NC11290] crashed, killing company executive Conrad Dietz. C-2, PC-2 Scout 1929 (ATC 351, 2-216) = 1pOhwM; 26hp Aeronca E-107; span: 36'0" length: 20'0" load: 274# v: 80/65/32 range: 240; ff as Aeronca: 10/24/29 (p: Fred Fluck) [X3774]. Jean Roché, based on 1925 Roché-Dohse Flying Flivver (qv). First production aircraft was the beginning of the 22-year Aeronca line [X626N] c/n 2. $1,545, $1,245 in 1931; POP: 167, of which 3 were PC-2 on wooden floats. Several produced as 2p with notably cramped seating. (2-216) superseded by (351). C-2N Deluxe Scout 1931 (ATC 448) = 36hp Aeronca E-113; load: 274# v: 82/75/32 range: 300. $1,695; POP: 2 [NC13083, NC13089=NACA95], plus 1 converted from C-1 [NC11417], and one from C-2 [NC643W]. C-3, PC-3 Collegian 1931 (ATC 396, 2-333) = 2pChwM; 36hp Aeronca E-113; span: 36'0" length: 20'0" load: 470# v: 82/75/38 range: 300. Continuation of the C-series, popularly known as "Razorbacks." $1,895; POP: 439, includes many conversions to C-3 Master; 14 PC-3 on floats, and 1 modified from C-1. Five appear in production records as C-3-SP "Special Purpose," but with no data. Several assembled in England as Aeronca 100. (2-333) for 28hp Aeronca E-107A. C-3 Master (aka Duplex) 1931 (ATC 2-375) = Deluxe Collegian with enclosed cabin, rounded spine. $1,695; POP: 2 as floatplanes [NC11277, NC11416]. CF Scout 1936 (655) = Same as KC Scout, with 40hp Franklin 4AC; v: 90/85/38 range: 250. POP: 6 [prototype NX21355 c/n CF-1, NX22157, NC22196, NC22304, NC22391, NC23528]. K 1937 (ATC 634) = 2pChwM; 42hp Aeronca E-113; span: 36'0" length: 20'7" load: 450# v: 93/85/38 range: 255. Roger Schlemmer (K-series). $1,480, $1,745 in 1938; POP: 344; prototype [X17440]. KC Scout 1937 (ATC 655) = 2pChwM; 40hp Continental A-40; span: 36'0" length: 20'7" load: 452# v: 93/85/35 range: 225. $1,590; $1,295 in 1939; POP: 34. Float version was the two-door KC Sea Scout. KCA Chief 1938 (ATC 675) = 50hp Continental A-50; span: 36'0" length: 21'1" load: 450# v: 100/90/35 range: 250. $1,695; with 65hp, $1,795; POP: 62. Evolved into the wide-cabin 50C Chief. KF Chief 1938 (ATC 688) = 2pChwM; 50hp Franklin 4AC; span: 36'0" length: 20'7" load: 452# v: 100/90/35 range: 225. $1,595; POP: 5 [NC21067, NC21063, NC21092, et al]. Evolved into 50F Chief. KM Chief 1938 (ATC 676) = 2pChwM; 50hp Menasco M-50; span: 36'0" length: 20'7" load: 452# v: 100/90/35 range: 250. $1,590; POP: 9. Evolved into 50M Chief. KS Sea Scout 1937 (ATC 634) = 2pChwMF version of K. POP: 13. L-3, O-58 Grasshopper 1941 = Military version of 65 with greenhouse cabin and 65hp Continental YO/O-170-3; data similar to civil models. Originally designated as O-type, changed to L in 1942. L-3D to -3J were impressed by USAAF. L-3 (O/YO-58) = POP: 54 [42-456/459, 43-2809/2858]. L-3A (O-58A) = POP: 20 [42-7793/7812]. L-3B (O-58B) = POP: 875 [42-14713/14797, -36075/36324, -38458/38497, 43-26754/27253 ]. L-3C = No radio, weight reduction. POP: 490; additionally 253 built as TG-5 gliders, of which 3 transferred to USN as XLNR-1 [36422/36424]. L-3D = Impressed 65TF with Franklin AC-167. POP: 11. L-3E = Impressed 65TC with Continental A-65-8. POP: 12. L-3F = Impressed Super Chief with A-65-8. POP: 19 [42-78044]. L-3G = Impressed Super Chief with Lycoming O-145-B1. POP: 4. L-3H = Impressed 65TL with O-145-B1. POP: 1. L-3J = Impressed 65TC with A-65-7. POP: 1. L-16 1947 = Military version of 7BC/7EC. Data similar to civil model. L-16A = 85hp Continental O-190-1. POP: 509 [47-788/1296], of which 376 were initially slated for Natl Guard units. L-16B = Dorsal fin. 90hp Continental O-205-1. POP: 100 [48-424/523]. LA, LW 1935 (ATC 596) = 2pClwM; 70hp LeBlond 5DE; span: 36'0" length: 22'6" load: 644# v: 115/100/48 range: 500; ff: 11/x/35 (p: Fred Fluck). Giles Barton, Roger Schlemmer (L-series). 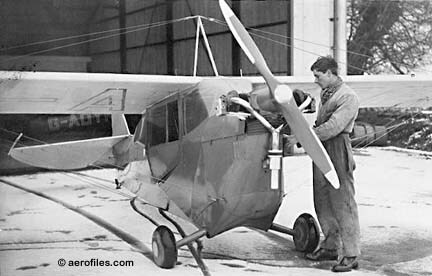 About $2,750; POP: 13, includes prototype LW with 42hp Aeronca L-113, which was so underpowered it only made one short flight [NX14558]. LB 1936 (ATC 596) = 2pClwM; 90hp LeBlond 5DF; span: 36'0" load: 669# v: 120/105/48 range: 500. $3,000; POP: 28. Also with 70hp Rearwin-LeBlond. LC, LCS 1936 (ATC 614) = 2pClwM; 90hp Warner Jr; span: 36'0" length: 22'4" load: 646# v: 123/108/45 range: 535. First had 50hp Warner. Company's first departure from its high-wings. $3,275; POP: about 25, of which 1 was the float-equipped LCS [NC16289] (load: 659# v: 116/100/48 range: 450). Monowheel Racer 1931 = 1p single-wheel design with skids at each wingtip to keep it steady in ground runs, but its whys and wherefores are unexplained; for certain it was not a company product. Shown in registers only as a racer (p: Carl E Recknagel), and competed in 1933 wearing race number 17 [NR12407]. Came in third in the 115-c/i free-for-all.